Drafting chairs have been available for quite some time now. They have always been a really niche product, best suited for very specific uses. With the growth in standing desk usage in recent years, drafting chairs are also becoming more popular. They are a natural fit to be paired with a standing desk. This has caused manufacturers to come up with more designs and more options. There is now a wide selection of drafting chairs that offer a range of different functions, upholsteries and aesthetics. We sell many different types of drafting stools on BTOD.com. We have for years. We have taken our experience with drafting chairs and what our customers have liked, to compile a list of the best drafting stools. 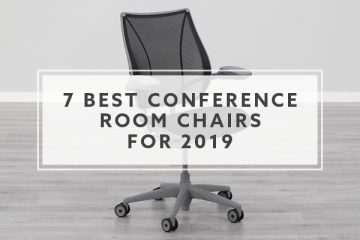 This list will not provide a perfect solution for everyone, but it should help to get an idea of what is available and what to look for when shopping for a new drafting chair. How Did We Pick Our Best Drafting Chairs? The first drafting chair on our list is the Nightingale LXO Stool. This is a well rounded stool that we feel will be comfortable for most people. It is a drafting chair that has been popular for us on BTOD.com, specifically for people that want a nice quality drafting chair but don’t want to break the bank. The LXO Stool is made in Canada with a good build quality and backed by a really solid warranty. It features a breathable mesh backrest with a natural lumbar curve. The mesh is comfortable and holds its shape well. The LXO has some characteristics that make it stand out from most drafting chairs. The first is the adjustability on the chair. It comes with pneumatic seat height, a synchro-tilt mechanism, tension adjustment and multiple locking positions. It has seat depth adjustment, back depth adjustment and your choice of height adjustable or 4-way arms. The LXO Stool is also unique because of the seat. The seat is thick padded with ENERSORB™ foam, which is Nightingale’s memory foam. The seat allows you to sink into it so it feels nice and soft while also being supportive. Choose between a variety of different casters depending on what you are using the LXO Drafting Chair for. You have a couple different carpet caster options and a soft caster option. You can also go with glides if you would prefer that your drafting chair does not roll. 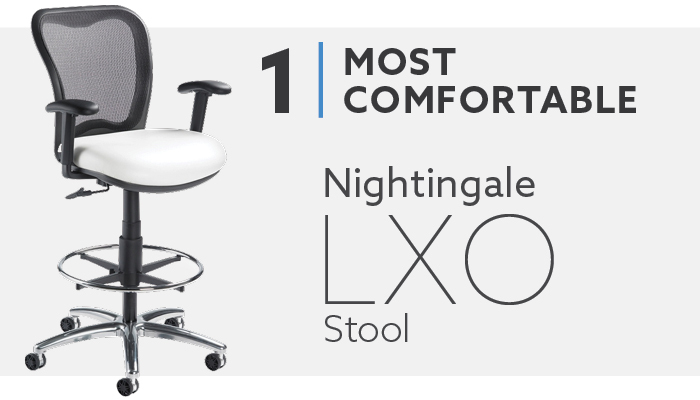 The biggest downside with the LXO Stool is that the Nightingale chairs are not returnable. Each chair is considered custom made so all sales are final. The LXO is also be a poor choice for people that have used memory foam and do not like it. Our pick for best ergonomic drafting stool is the Right Chair by Neutral Posture. 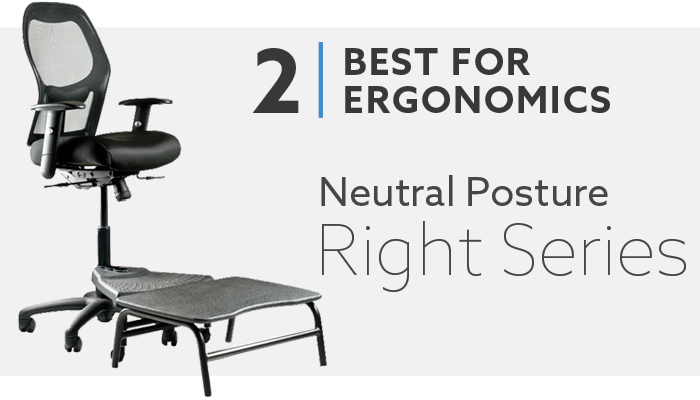 Neutral Posture is a company that focuses heavily on producing high-end ergonomic chairs, so it is no surprise that our best ergonomic pick came from Neutral Posture. The Right Chair features a mesh backrest and padded seat. The chair is loaded with adjustments. You have adjustable lumbar support and back angle adjustment. It has seat height, seat depth and seat angle adjustments. There are also a number of arm options, including 5-way arms for maximum adjustability. On top of the high level of adjustability, you also have some customization to make the chair more comfortable for you. There is a memory foam option for the seat, and the choice between two seat sizes, which helps to ensure the best fit for you. There are two headrest options if that is something you are looking for. Neutral Posture has a unique set of step options you can choose from. They have the traditional ring you see on most stools, but they also have a plastic option and an extended version if you want a large platform. You can also choose from carpet casters, hard surface casters or glides. Unfortunately, the Right Chair shares the same downside as the LXO. Neutral Posture makes their chairs to order so they do not accept returns. 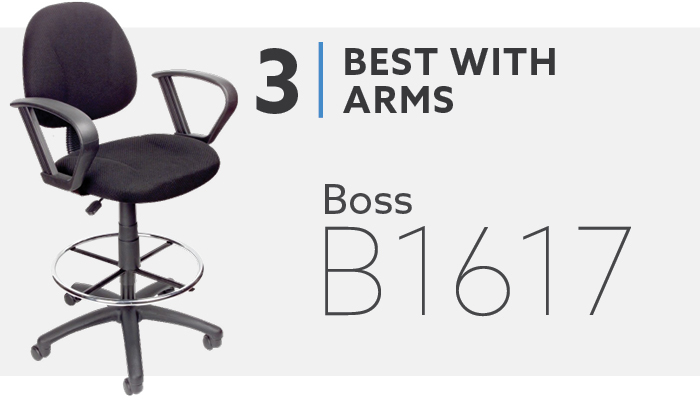 The Boss B1617 Drafting Stool is the most popular drafting chair with arms on BTOD.com. The chair has a basic design, but it provides a really good value at a price of less than $150. The stool features a padded seat and back with fabric upholstery. The seat and back are contoured for added comfort. The stool has plastic loop arms. They do not have any adjustability, but they still offer support for those times when you need to rest. The only adjustment on the B1617 is pneumatic seat height. The basic design and limited functionality make the chair easy to use so it can be placed in almost any environment where a break from standing is needed. The B1617 comes standard with a 20” chrome footring and your choice of four different fabric options. You can also choose between carpet or hard surface casters. The B1617 is priced below $150 for a reason. 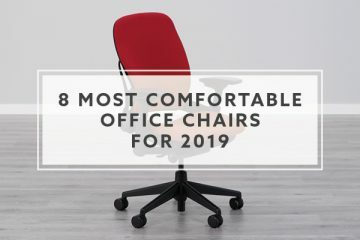 It doesn’t have the adjustability the other chairs on this list do. It also has the lowest build quality of the chairs featured. It is made in China with some really basic components. There are no additional options or ways to customize the chair to your liking. 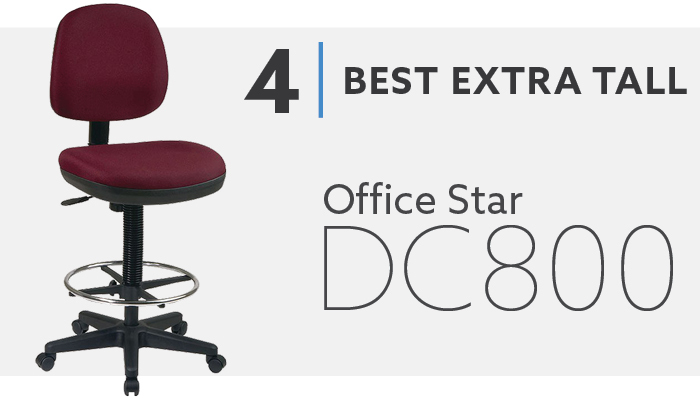 The DC800 from Office Star locked up our pick for best extra tall drafting chair. It has a 10” cylinder with a seat height range of 24”-34”, which is the tallest drafting stool we offer on BTOD.com. The stool comes with a padded seat and back with a large range of fabric choices. The DC800 has the option to add height and width adjustable arms. All models come standard with seat height adjustment, back height adjustment and seat depth adjustment. An adjustable chrome footring also comes standard on the DC800. The backrest has a natural curve built-in for lumbar support and also has a flexible backrest with adjustable tension. This allows the backrest to have a bit of a recline function. Overall, the DC800 is a pretty basic drafting stool, but it provides nice functionality and a massive seat height range for right around $200. The DC800 is brought in from China and has some basic components. This helps to keep the cost of the stool down, but the quality is on the lower end of the spectrum. It also has a limited set of adjustments and no customization aside from the upholstery options. The list of white drafting stools is quite short. Some options incorporate white into portions of their design but there are very few options that offer white frame with white upholstery. 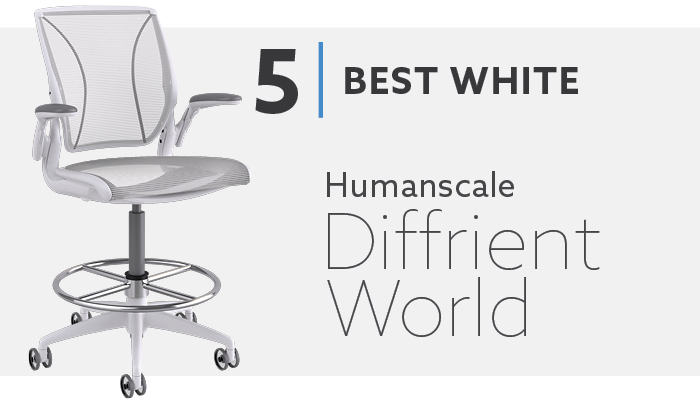 The Diffrient World by Humanscale is one of those options. It is a high-end chair that is well suited for high design applications. The Diffrient World is a mesh back chair with a variety of seat upholstery options. Humanscale offers two white options. The first is a pinstripe mesh, which will match your white mesh back. The second option is a white vinyl that is easy to clean and ideal for healthcare and lab applications. The Diffrient World utilizes Humanscale’s weight sensitive recline so there are no locking positions or tension knobs. It comes standard with seat height and depth adjustment. You then have your choice of arms. The 4D arm option offers great adjustability. A lot of mesh chairs have thick seat frames that cannot be covered. Humanscale removed the front of the seat frame but the sides may still be an issue because they are uncomfortable if you can feel them. The recline function may also be a turn off for a stool application. The recline forces your legs and hips into an open angle by lifting the back of the seat up as the back reclines. Instead of rocking, you are put into a more open posture. This is meant to be good for tasking but may not be ideal for a stool. The WL-735SYG-BK-LEA-AD-GG is our pick for best big and tall drafting chair because of the value it provides at a price of $350.99. This is a big and tall drafting stool that has a weight capacity of 400 lbs. It has a 21.5” wide seat that has five inch thick padding, so it is specifically designed for larger people. Along with reinforced components and thick padded cushions, the WL-735SYG-BK-LEA-AD-GG has a surprising amount of adjustability. It features a synchro-tilt mechanism with infinite position lock and tension adjustment. The stool features seat height and back height adjustments. You also get height adjustable arms and a height adjustable footring. 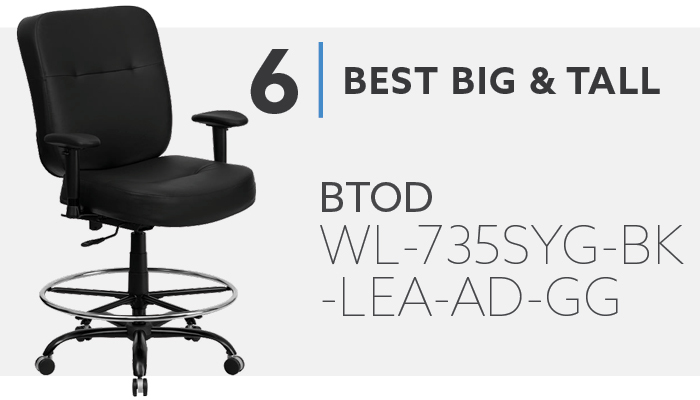 The WL-735SYG-BK-LEA-AD-GG has a lower end build quality, so the chair does have some lower quality parts. 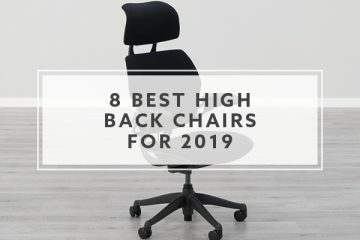 The parts are designed to be stronger than standard parts, but they are still not going to be the same quality as the high-end chairs on this list. This is shown by their short two year warranty period. The WL-735SYG-BK-LEA-AD-GG features faux leather instead of real leather and the option to add soft casters is not available. There are not a ton of drafting chair options that feature real leather. 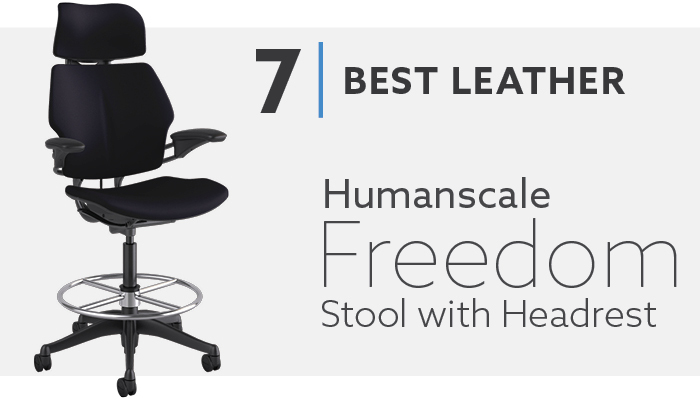 Luckily we were able to find a really nice high end option in the Freedom chair by Humanscale. This is one of the highest quality drafting chairs available and it’s backed by one of the best warranties in the industry. The Freedom Stool is available in two different leather grades and seven different colors to choose from. Both grades are commercial quality. They are soft to the touch and have a nice texture. They offer good durability. The Freedom is also a nice option for ergonomics. It has seat height and depth adjustment. It also has backrest height adjustment, which helps to align the lumbar curve. A pivoting backrest positions it at the best angle to provide the best support. There is also an optional headrest that can be added that goes in the curve of your neck. The Freedom has Humanscale’s weight sensitive recline function. Like the Diffrient World, there are no tension controls or tilt lock positions. The chair reclines automatically based on your body weight. There are a few arm and caster options to choose from so that you can customize the chair to your exact needs. The biggest downside with the Freedom chair is that it has a high price. The price can get well over $2,500 if you opt for all the upgrades. The price will put the Freedom out of reach for a lot of people’s budgets. The recline motion may also be a problem for some people. The back of the seat raises as you recline so you do not have a typical rocking motion. This may feel awkward for some people, especially when you are so far off the ground. The Cramer Rhino Stool is the prototypical industrial stool. This chair is ideal for factories, laboratories, clean room and ESD applications. The seat and back are made from polyurethane. The material is durable and easy to clean. It can even take harsh cleaners like alcohol or bleach. The chair is built like a tank as shown by Cramer’s 10 year warranty on 24 hour usage for people up to 300 lbs. The stool comes with a 20” adjustable chrome footring. There are a few other footrest options to choose from. There are two back sizes to choose from: small or medium. There are a number of different caster and glide options for whatever application you need. There are also three different arms you can choose to add, from fixed arms to fully articulating arms. The Rhino provides some nice adjustability. The chair comes with seat height adjustment, back height adjustment, back angle adjustment and the option to add seat angle adjustment. These four adjustments, combined with the fully articulating arms, give you a lot of adjustability on an industrial drafting stool. 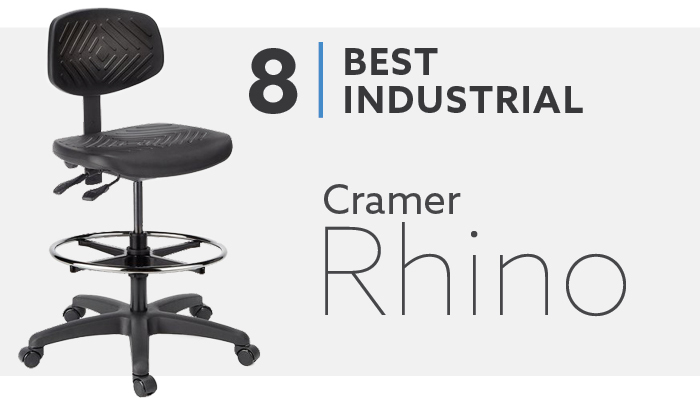 The Rhino has good adjustability for a drafting chair, but it may not be the best option for providing ergonomic support if you need something for longer hours. The polyurethane material is not as forgiving as the traditional padding and the backrest is not designed with a very good lumbar support system. The final chair on our list may be the most impressive drafting chair of them all. 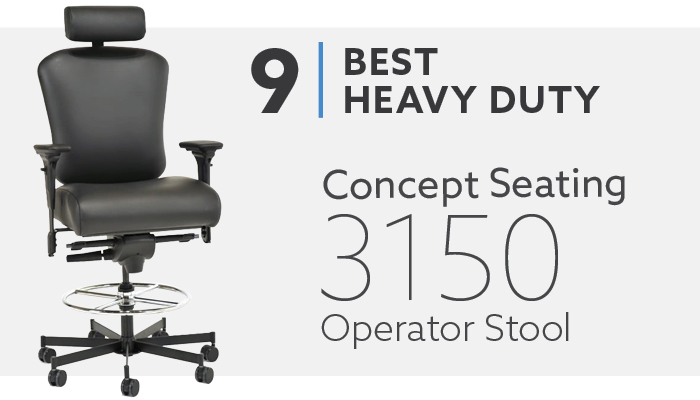 Our best heavy duty drafting stool pick is the 3150 Operator by Concept Seating. This is a stool that is built to take the most rigorous of use. It is made in the USA with an all steel frame, seven leg base and high-end mechanism. This chair comes in a 21” or 23” wide seat, has a weight rating of 550 lbs. and can be used round-the-clock. It comes with six years of coverage on all the parts. The seat has a unique air suspension system, so it provides a soft sitting experience without the use of thick foam or springs. The seat also has height and depth adjustment. The chair reclines with a synchro-tilt mechanism and has five lockable positions, including forward seat tilt. The backrest is height adjustable and the 3150 features an inflatable lumbar system. The pump reminds me of the pump for taking your blood pressure. You just squeeze it until the lumbar is how you like it and let the air out to lessen the support. You can also choose between several options. There are a variety of different upholstery colors. There are also a couple different adjustable arm options. You can choose to add an adjustable headrest as well. Overall, this is a really nice drafting chair. The price is the biggest deterrent to the 3150 Operator Stool. The chair is really well built but it might be priced too high for some people. The term “Drafting Chair” is interchangeable with “Drafting Stool”. These chairs originally applied to people who were using a stool with a drafting table. Drafting tables are large and have a slanted portion that makes them quite tall. You can stand at the table, but it is also nice to be able to take a break from standing while still being able to work. A stool was the solution to that problem and gradually those stools were tweaked and modified until they were designed to be great solutions for sitting while drafting. The world has changed a lot since the need for a drafting chair arose. There are now a lot more jobs that can benefit from the ability to sit down. There are many positions where a counter height chair can greatly improve the comfort and health of an employee. A drafting chair in today’s terms is going to be much broader. It is not simply made for people that need to sit down while drafting. A drafting chair today is just an office chair that has a taller seat height than normal chairs and also some type of footrest. The seat height will typically be around 30” on most drafting stools. Some chairs will have arm options, but some will not. How Did We Pick Our Drafting Chairs? When we started the process of considering which stools to include on our list, we first had to identify the needs of most people when searching for a drafting chair. What are the factors that are most important and what applications are these chairs being used for? After addressing these two questions, we came up with chairs that meet specific criteria to fulfill the needs of our customers. 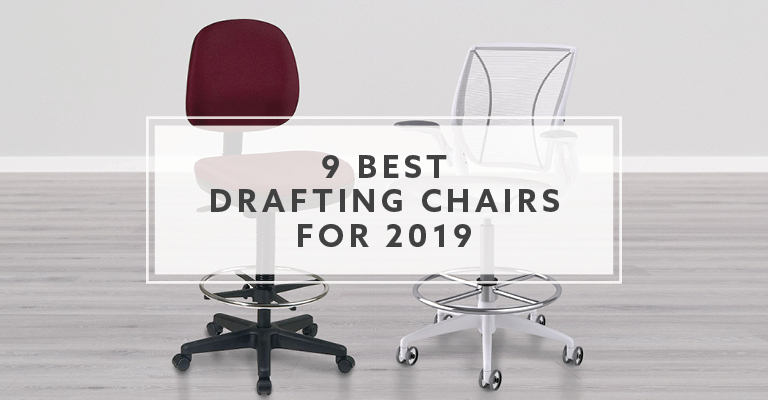 Once we knew which types of chairs we needed to include, we used our experience using drafting chairs and our sales history with them to pick the specific drafting chairs included on our list. We have been selling drafting chairs for nearly two decades. We know what is important to look for, which manufacturers are better than others and what you will want to avoid. We also have a strong history of drafting chair sales to go off of. We can use this history to see which chairs have been popular and which chairs haven’t. We can see if a particular chair has had a lot of warranty issues or customer complaints and we know not to include that chair on the list. The most important thing to consider when looking for a new drafting chair is the seat height range. This is usually going to depend on the height of the desk, table or counter that you will be using the stool with. For these situations, you will want to measure the height of the table and then make sure the stool you are considering has a seat height range that is around 8-12” lower. For example, if your counter height is 42”, then you will want to look for a stool that has a seat height range of 30-34”. If you have a height adjustable desk, then you do not need to worry as much about the seat height. You have more freedom to put your priorities in other areas because you can use your desk to match the drafting stool. The only really important thing to think about in this situation is that the stool is not too tall for you to get out of comfortably. The same goes for those of you that are not using the stool at a counter or desk. This can be common for people like photographers. Our studio has a drafting stool that can be used to give the person shooting the video a break from standing, while still being able to record footage. The main concern with this application is that the stool goes low enough to be able to get in and out of it comfortably and easily. It can also allow your feet to easily touch the ground to make it easier to wheel the stool around while remaining seated. Another thing to consider is what type of footrest you prefer. Almost all drafting stools have some sort of footrest. Otherwise, your legs are just dangling in the air, which is uncomfortable and bad for your circulation. There are three main types of footrests available: teardrop, platform or ring. The most common footrest is the footring. This is usually a metal circle that goes completely around the chair. Many footrings have height adjustment so that you can put it in the best position for you. Footrings are the most functional option for most applications. A teardrop footrest is a metal U shaped bar that hangs from the underside of the seat. Sometimes they will be tied to the seat and will only move with the seat. Other products have tear drop footrests that will swivel separately from the seat. The teardrop is not as versatile as the footring, but some people find it to be more comfortable. The final footrest option is the platform. This can be metal or plastic and acts as both a step and a footrest. These products offer much more surface areas to rest your feet on, but they are not always the best options for people that are constantly moving their chair around their workspace because they are a bit more clunky than the footring. Adjustability is another thing to consider. Drafting stools are inherently less adjustable than similarly priced office chairs. Sometimes customers can be surprised by the lack of functionality on some drafting chairs. This is the last thing we want to happen. Nothing is more disappointing than getting a new office chair and then immediately finding out that it isn’t what you thought it was. Before you start looking at drafting stools, think about what functions are crucial for you. Are you a tall person that will really value seat depth and back height adjustment? Maybe you will be doing heavy tasking and want some seat tilt and adjustable arm options. Whatever the functions are, know what you need so that you can search for chairs that meet your requirements and avoid the chairs that don’t. The type of upholstery is important to think about. Some upholsteries excel in some areas but not so much in others. Urethanes and vinyls are great for factory and industrial applications. They are also perfect for laboratories, cleanrooms and medical facilities because of how easy they are to clean. But, they are probably not the best option for office settings because they are not as visually appealing. Fabric and mesh are nice for offices, homes and classroom environments. They look nice and are comfortable to use. They are not great for factories or industrial areas because they are not very easy to clean and can hold particles and debris that won’t happen with urethane or vinyl. Leather is the final upholstery we see on drafting chairs. Leather is not the most durable so it is not as well suited for areas that urethane and vinyl excel in. But, leather has the nicest look and most high-end appeal. This can be attractive for home users or people in executive offices that may want to pair a drafting stool with a standing desk. There are several different types of drafting chairs. Different chairs are better suited for different situations. The drafting stool market has grown to a point where you can find almost any type of product to meet your needs. This is both good and bad. It is good to have a product available to meet anyone’s needs but that also means that the market is flooded with products which can often be difficult to sort through. This list has a good mix of different style products. These are not only products that we like but many of them are also products that our customers have found to be nice options. If you can’t find something that meets your needs on this list, then make sure to use our things to consider when shopping for a drafting chair. You’ll have a good foundation to use to find the best drafting chair for you.